Clockwise frae tap: View o Gowden Horn atween Galata an Seraglio Pynt includin the historic auries; Maiden's Touer; a nostalgic tram on İstiklal Avenue; Levent business destrict wi Dolmabahçe Palace; Ortaköy Mosque in front o the Bosphorus Brig; an Hagia Sophia. Istanbul (Turkis: İstanbul [isˈtɑnbuɫ] ( listen)), historically kent as Constantinople an Byzantium, is the maist populous ceety in Turkey an the kintra's economic, cultural, an historic centre. Istanbul is a transcontinental ceety in Eurasie, straddlin the Bosphorus strait (which separates Europe an Asie) atween the Sea o Marmara an the Black Sea. Its commercial an historical centre lies on the European side an aboot a third o its population leeves on the Asie side. The ceety is the admeenistrative centre o the Istanbul Metropolitan Municipality (coterminous wi Istanbul Province), baith hostin a population o aroond 14.7 million residents. Istanbul is ane o the warld's maist populous ceeties an ranks as the warld's 7t-lairgest ceety proper an the lairgest European ceety. Foondit unner the name o Byzantion (Βυζάντιον) on the Sarayburnu promontory aroond 660 BCE, the ceety developed tae acome ane o the maist signeeficant in history. Efter its reestablishment as Constantinople in 330 CE, it served as an imperial caipital for awmaist 16 centuries, during the Roman an Byzantine (330–1204 an 1261–1453), the Laitin (1204–1261), an the Ottoman (1453–1922) empires. It wis instrumental in the advancement o Christianity during Roman an Byzantine times, afore the Ottomans conquered the ceety in 1453 an transformed it intae an Islamic stranghauld an the seat o the Ottoman Caliphate. Istanbul's strategic poseetion on the historic Silk Road, rail networks tae Europe an the Middle East, an the anerly sea route atween the Black Sea an the Mediterranean hae produced a cosmopolitan populace, awtho less sae syne the establishment o the Turkis Republic in 1923. Owerleuked for the new caipital Ankara during the interwar period, the ceety haes syne regained much o its prominence. The population o the ceety haes increased tenfauld syne the 1950s, as migrants frae across Anatolie hae muived in an ceety leemits hae expandit tae accommodate them. Airts, muisic, film, an cultural festivals war established at the end o the 20t century an continue tae be hostit bi the ceety the day. Infrastructur impruivements hae produced a complex transportation network. Approximately 12.56 million foreign veesitors arrived in Istanbul in 2015, five years efter it wis named a European Caipital o Cultur, makkin the ceety the warld's fift maist popular tourist destination. The ceety's biggest attraction is its historic centre, pairtially leetit as a UNESCO Warld Heritage Steid, an its cultural an enterteenment hub can be foond athort the ceety's naitural harbor, the Gowden Horn, in the Beyoğlu destrict. 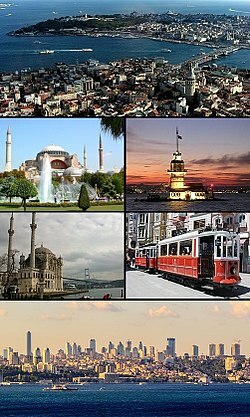 Considered a global ceety, Istanbul haes ane o the fastest-growin metropolitan economies in the warld. It hosts the heidquarters o mony Turkis companies an media ootlets an accoonts for mair nor a quarter o the kintra's gross domestic product. Hopin tae caipitalise on its revitalisation an rapid expansion, Istanbul haes bid for the Simmer Olympics five times in twinty years. ↑ "Population and Demographic Structure". Istanbul 2010: European Capital of Culture. Istanbul Metropolitan Municipality. 2008. Retrieved 27 March 2012. ↑ "The World According to GaWC 2010". Globalization and World Cities (GaWC) Study Group and Network. Loughborough University. Retrieved 8 May 2012. ↑ Berube, Alan (1 December 2010). "Global Growth on the Orient Express". Brookings Institution blog "The Avenue". Retrieved 14 April 2013. ↑ "IOC selects three cities as Candidates for the 2020 Olympic Games". The International Olympic Committee. 24 May 2012. Retrieved 18 June 2012. Wikimedia Commons haes media relatit tae Istanbul.